This past July, I boarded a plane and headed to Norwich, Vermont for a week long "bake-cation." The destination was the Baking Center located at King Arthur Flour's flagship campus. 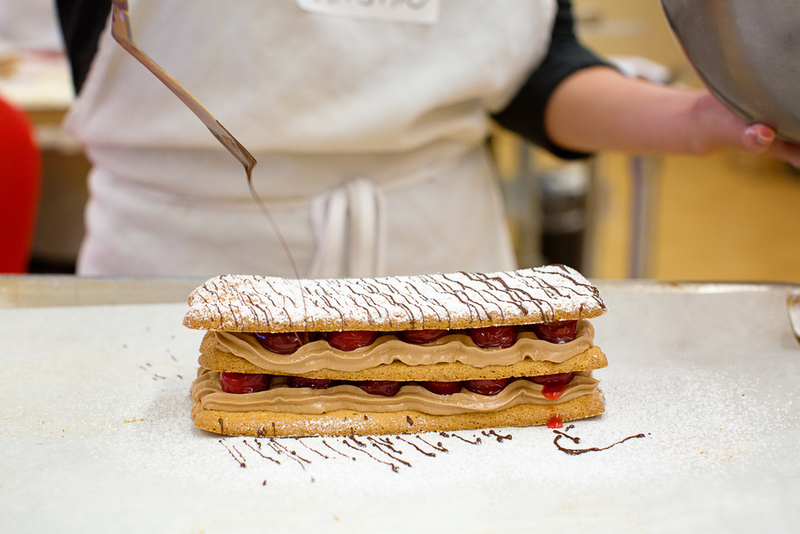 Along with a baker's store and bakery, the campus features a baking school, which teaches a range of bread and pastry courses at levels from beginner to professional. Since it has long been my dream to go to culinary school, I couldn't imagine a more indulgent way to spend a vacation. I signed up for two courses: Beauty and the Baguette and Pastry Principles & Practice. The baguette course was the first on the list and took place during a single afternoon. Entering the classroom, I wasn't sure what to expect, but the whole experience left me pleasantly surprised. The class sizes were kept small and each student was supplied a fully equipped station. The instructor broke the lesson down into sections, demonstrating a few steps before giving us a chance to try it out on our own. What impressed me the most, however, were the dozens of baguettes prepared at various stages so that we would all be able to practice the shaping and slicing techniques until we had it mastered. Though the class consisted of people who had never kneaded dough to people who bake bread several times a week, we all came away with perfect baguettes and the knowledge on how to make them at home. I learned more about crusty bread in those four short hours than I have in years of trial and error on my own. I mean, look at these beauties (made in my own oven, no less)! The second course, Pastry Principles & Practice, was an in depth course, lasting four days and spanning everything from pie and puff pastry to tarts and eclairs. Even though I had my fair share of pastry knowledge going in, the course was taught in such a way that home bakers and professionals would all have new information to gain. I was familiar with most of the techniques, but the reasons why each step was necessary was fascinating for me. Even with something as basic as cake, I was shocked by how much I didn't know or hadn't considered. I came away with pages of notes, scribbled in the margins of the recipes, on techniques, flavor combinations, and the science of baking. Overall, I adored my time at King Arthur Flour's facilities and highly recommend their courses. Even as an experienced baker, I came away with a wealth of new knowledge and techniques to play around with at home. If you live in the Northeast, do consider taking a class at the Baking Center. They have many courses for holiday baking and bread making coming soon. In partnership with King Arthur Flour, I will be bringing you a new recipe each month, for the next six months, filled with step-by-step instructions and photographs to help you grow as a baker. I am so excited to share the new techniques I learned with you! We will start with easier recipes, like scones and cakes, and tackle more difficult recipes as the months pass (like eclairs and crusty breads!). By the end of our journey, you'll have a solid understanding of basic yeast breads and pastries. I hope you bake along with me! You can show off your baking creations by tagging them with #kingarthurflour. Roll up your sleeves and pull out the flour, because it's about to get delicious in here. Scones are versatile pastries that are easy to assemble with interchangeable ingredients to match the flavors of the season. Similar to pie crust and biscuits, the real secret to great scones is cold ingredients and limited handling. To start, whisk together the dry ingredients. Take butter—which must be cold—and cube it with a knife. Add the butter to the dry ingredients by rubbing it between your fingers until the dough resembles coarse sand. If you have a few larger pieces of butter (as shown above), that is actually a good thing! Alternatively, you can bring out a pastry blender for this step, but I don't recommend using a food processor or mixer because you lose control over the size of the butter pieces. The cold butter layered in the flour is the trick to creating a flaky scone. When the butter melts in the oven, it will leave pockets between the flour, creating layers. If your butter softens or melts before baking, these layers will not form. If your kitchen is too warm, place the mixture in the refrigerator to cool down the butter before moving on. For the next step, whisk together all the wet ingredients and, along with the blueberries, add it to the flour mixture. Using a bowl scraper, delicately fold the dough on itself just until it is evenly moistened. Turn out the dough onto a lightly floured surface. If you need to knead the dough to bring in any dry pieces, it is okay to do so, but knead only a few times to limit your handling. Ideally, we want to avoid over mixing or overworking the dough. Mixing or kneading the dough encourages gluten to form. While gluten formation is wonderful for bread dough, it is the opposite of what we look for when creating light, flaky pastries. Using floured hands, bring the dough into a ball and flatten it into a disk with your palms until it is roughly 1-inch thick. Using a bench knife (or sharp kitchen knife), cut the dough into 6-8 pie shaped pieces. Be careful to only use a straight up and down motion when cutting the dough. Using a dull knife or moving the knife side-to-side will seal the edges of dough, which will prevent the scones from rising to full height in the oven. Brush the scones with heavy cream to encourage browning and set them into the oven to bake. Blueberry Honey Scones are flaky, decadent morning pastries that are best served alongside a mug of coffee or tea. Fresh blueberries and honey are the star flavors in this scone, adding chords of sweet and tart to the overall character. Before serving, drizzle the scones with additional honey and serve with a side of creme fraiche. In a large mixing bowl, whisk together the flour, baking powder, and salt. Add the cubed butter and rub the butter between your fingers until the dough resembles coarse sand with a few larger pieces remaining. Set aside. In a small bowl, whisk together the egg, vanilla, honey, and heavy cream. Pour over the scone batter, add the blueberries, and lightly mix until the dough comes together. The dough will be somewhat sticky. Place the dough on a lightly floured surface. With floured hands, form the dough into a circle. If you need to fold the dough over to evenly distribute the moisture, you may do so, but no more than a few times. Flatten the dough until it is about 1-inch thick. Using a sharp knife, cut 6-8 equal pie wedges. Transfer scones to a baking sheet using a flat spatula and brush the tops of the scones with heavy cream. Bake for 25-30 minutes, or until lightly browned. Drizzle the scones with honey and serve with a side of creme fraiche. Tag your creations with #kingarthurflour to show off your baking! *Frozen blueberries (not thawed) will also work, but the berries will dye the scone a bright blue.